Set up a robust website for a growing online business. Price Range $8888 and up. Develop up to a 20-page Custom Website. Strategy discussion with our experts followed by analysis report for developing an online lead generating and sales converting business (setting up an automated sales funnel and pages on social media sites that is best suited for your business). Develop up to a 20-page e-commerce capable Website with On-page SEO and matching pages on Facebook, Instagram and Google etc. Offsite SEO strategy to be developed working closely with the client. This includes detailed copy writing and Business photos for the site (may be an additional cost). Domain name registration and hosting if you don’t already have it. In addition FREE for the first 3 months to help get you started. Foundational Content marketing strategy creation and execution for 3 months. 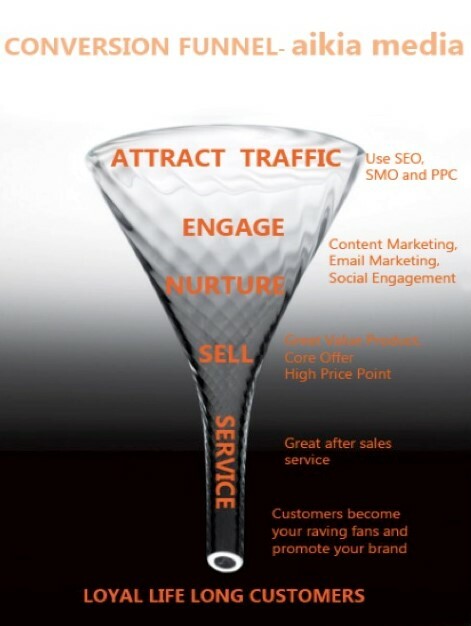 (remember content marketing strategy is key to the success of your sales funnel). Foundational Social media strategy development and execution for 3 months. Advanced Content marketing and Social media strategy development and execution for 3 months ( basis feedback from the foundational strategy). Run Advertising campaigns on search-engine and Social media platform to get customers where you only pay per click – Duration 3 months. While the charges for making the ads and running the advertising campaigns are included in the package the advertising price paid per click to the site or search engine used for advertising will have to be paid separately as per the actual expenses incurred. If you want any online product to be developed for the effectiveness of your sales funnel these will be charged separately as well. After that, this service is charged separately starting at $888 and up per month. Connect with our experts now.